I wonder out of this bunch would be the best hitter? I’m going to put my money on Scott Hartnell for power and I can see Claude Giroux being a feisty little slap hitter. 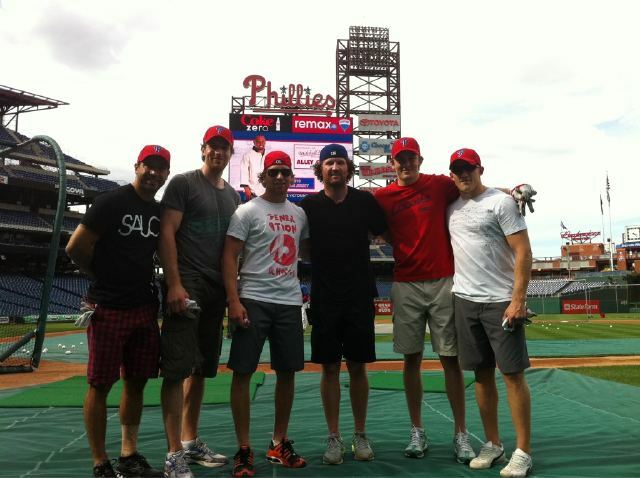 James van Riemsdyk and Matt Carle are the only USA-born players on the Flyers but that won’t make much of a difference, especially because Sidney Crosby, a notorious Canadian, hit a bomb at PNC Park during batting practice once. Kind of cool. I hope to see some pictures of the BP on Twitter. According to the NHLFlyers Twitter account, who posted the above picture, JvR hit a home run during BP. And I had my money on Harts. Todd Zolecki also tweeted that Phils hitting coach Greg Gross said a lot of the Flyers players were low ball hitters. Naaawww, really? Looks like they are gearing up to play in this stadium in less than four months for the Winter Classic. Video of JvR’s homer, here.